Here is a comprehensive Pattaya travel guide offering information on travel and tourism including tourist attractions, excursions, shopping, nightlife, festivals, things to do, travel tips and Tour Packages. Pattaya, a premier beach resort of Thailand, attracts thousands of pleasure-seeking tourists from all over the world. The place offers a gamut of entertainment options including beach-based sports, excursions and nightlife. Tourists can indulge in water sports or take trips to offshore coral islands. 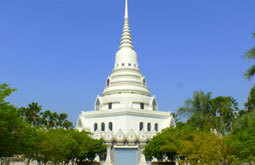 Pattaya travel offers the kind of experience, which encourages the tourists to visit the place again and again. Water sports are activities of choice on Pattaya travel and tourism. And the choice is huge. One can pick from the sports like windsurf, water ski, swim, sunbath, snorkel, sail, parasail and gamefishing. Pattaya holds several international and national sailing events every year. Water skiing is a popular sport as is parasailing. Experienced divers can enjoy themselves as boat diver, drift diver, underwater naturalist, and underwater videographer. Fun-filled beach activities like banana boat rides, jet skiing, and beach football can also be enjoyed on the beaches. Nightlife is another pillar Pattayas fame rests on. Bars and discotheques, thronged by merry-making people every evening, are open till early hours. Bars are the major place for night entertainment and Pattaya has thousands of these. Pattaya is famous for shows like Alangkarn Show, Tiffanys Show and Alcazaar Show. These shows are known worldwide for their flamboyance. As for the food, Pattaya offers the top cuisines of the world in its eating points. One can feed oneself in luxurious restaurants or simple street stalls. While the restaurants offer cuisines like French, Italian, Swiss, German, Hungarian, Scandinavian, English, Indian, Moslem, Japanese, and Chinese, stall deal mainly in Thai cuisine. However, as for the taste, one could get the best taste even in a small stall.